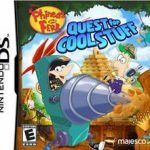 Phineas and Ferb: Quest for Cool Stuff (Retail $29.99 for Nintendo DS) is a super fun new title from Disney Interactive and Majesco Entertainment. Phineas and Ferb are always trying to come up with exciting things to do with their summer vacation, and in this game they decide to build a museum filled with all sorts of cool stuff in their backyard. Join them as they travel to a variety of destinations in search of artifacts cool enough to collect and display. Meanwhile, you’ll get to play some levels as Perry the Platypus while he thwarts the semi-evil Dr. Doofenshmirtz, who is planning to use his newest creation, the “get-rid-of-cool-stuff-inator” to take over the Tri-State area. This game is a treasure hunting adventure, where you’ll traverse a maze of landscapes in Phineas and Ferb’s A.T.T. (All-Terrain Transformatron), an amphibious vehicle that the brothers just invented. As you jump, drill, swim, and float your way through the levels, you’ll collect silver sprockets, and an assortment of unique collectibles. The sprockets you’ll use to upgrade your A.T.T. as well as the museum back in the brothers’ backyard. There are 4 episodes to explore, each with a handful of levels. You can play the levels as many times as you wish, to try and find all of the available collectibles that you may have missed on your first trip through. You’ll travel through ancient temples, underground mines, under the sea, an even into outer space. Fortunately, as you upgrade the A.T.T., you will unlock some special add-ons that will allow it to maneuver in all of these environments. You’ll also get to unlock some aesthetic features of the A.T.T. as well, like different wheels, paint jobs, and sounds. As you collect fun artifacts, you’ll be able to view all of them in the Museum of Cool. You will also be given several small quests from Phineas and Ferb’s friends, like bringing back a certain artifact or racing the clock to beat a level before time runs out. There are some dangers to watch out for in each level, like lava pits, laser beams, temple guardians, and evil Normbots. 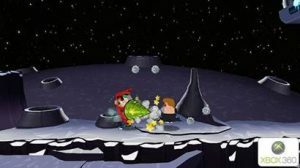 Jump on their heads or kill them with the spinning arms of your A.T.T., or a flying kick when you’re playing as Perry. 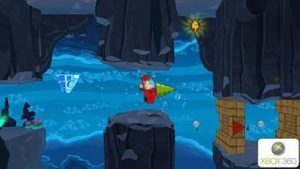 Phineas and Ferb: Quest for Cool Stuff presents just enough of a challenge to keep you engaged through all of the levels, but is easy enough for all ages to enjoy. Any fan of the Phineas and Ferb television show, or even a newcomer to the franchise, will have hours of fun exploring every corner of the diverse environments. My only wish is that the game was a little longer, because I didn’t want to stop playing after I’d finished all of the levels. 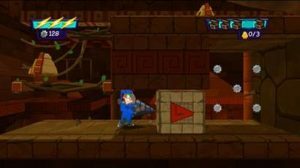 Take up the controls yourself and have a great treasure hunting adventure with the coolest brothers around, and their crime fighting pet platypus too. Also available for Nintendo 3DS, Wii, Wii U, and Xbox 360.